Weeds Shirt- Beautiful Weeds Shirt Here Must See! Beautiful Weeds Shirt for fans of the hit comedy/drama Weeds. "They're all made out of ticky tacky and they all look just the same." The opening song to the hit Showtime comedy Weeds, "Little Boxes" was written by Malvina Reynolds in 1962 and became a hit for Pete Seeger, a well known folk song artist. "Little Boxes" was written about conformist middle-class attitudes in Americna suburbia. 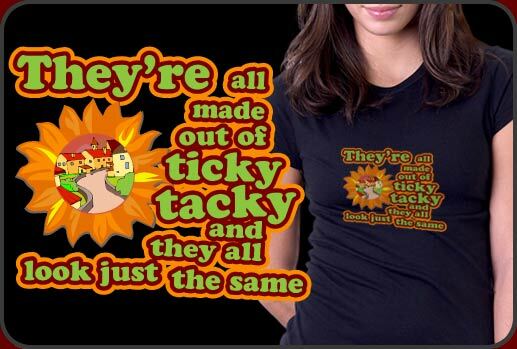 Our Weeds Shirt refers to the term "Ticky Tacky" which is a reference to the shoddy materials used in the construction of massive suburban expansion in the fifties and sixties. Our Weeds Shirt is a beautiful memorabilia piece for fans of the show and it prints wonderfully on both light or dark colors.